We are members of the BDA Good Practice Scheme which sets high standards in dentistry. 1. We aim to provide dental care of consistently good quality for all patients. 4. We look after your general health and safety while receiving dental care. 5. We follow current guidelines on infection control. 6. We check for mouth cancer and tell you what we find. 7. We take part in continuing professional development to keep our skills and knowledge up to date. 8. We train all staff in practice wide work systems and review training plans once a year. 9. We welcome feedback and deal promptly with any complaints. 10. Every member of the practice is aware of the need to work safely under General Dental Council guidelines. 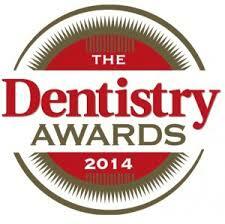 We were delighted to be awarded Best Dental Practice – South West and Wales at the 2014 Dentistry Awards. The awards awards are judged by a VIP committee of experienced people from all parts of the dental profession, including dentists, dental nurses, technicians and lay-people. With hundreds of entries from all over the UK. The awards recognise excellence in practice and outstanding individuals regionally around the UK. The event recognises outstanding individuals, teams and practices who have an active interest in staying at the top of the dental profession.